We offer will writing services from Royston in North Hertfordshire, but can meet clients in Herts, Beds, Bucks, Essex and into London. We are members of the Institute of Professional Willwriters which means that we have full professional indemnity cover and sign up to a strict code of conduct which can be seen at the IPW website (see links). One of the most important questions we are asked! We understand that budgets are important which is why as professional will writers we are very competitively priced against solicitors, despite offering a professional and bespoke service. Video instruction taking is now available! It also comes with 25% off our fees! Click here for more details on video wills and how our discount works. A selection of will and probate stories from Hertfordshire and the rest of the UK. Are you a biker? If so we will give you a free advanced motorcycle dvd with your completed will. Created by my dad Mike Waite, it is based on the UK police training system, and people have already said it has saved their lives with its techniques! We offer day and evening appointments! 8am to 9pm! Inheritance tax. For the 2018/2019 tax year, the inheritance tax allowance is £325,000. Trusts. Trusts can be used for life assurance to avoid inheritance tax! However, many people do not make use of this FREE and useful option. Probate. Many people think they need probate when they do not! Releasing money from bank accounts for example, may be possible with just a statutory declaration, if this is where the only assets are held. *Please note that the cost advertised is for a basic will, which tends to cover most peoples circumstances. Wills that include specialist trusts will be charged more due to the more complex nature of these wills and the fact that we create trusts to match each client's individual circumstances. Trusts may also be recommended for inheritance tax planning, but all clients will be made aware of extra costs before any work is carried out. 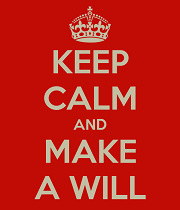 We do not charge anything until your will is legally valid - i.e. after signing. It always pays to look at all the small print on a website. If you take a will through us and mention you read all the small print, we will divert £5 of our fees to a local charity in your area - please tell us which one. We take our fee minus £5 and a £5 cheque payable to that charity. Just mention local charity when paying. Our IPW No. is 2154. Will writing, will planning, review an existing will, probate assistance and help, will storage, funeral plans, codicils, employee schemes, will discounts, business planning, protection, inheritance tax planning, property protection, last will and testament, executors, administrators, probate forms, attorneys, lasting power of attorney, enduring power of attorney, how a divorce affects a will, simple wills, mirror wills, bespoke wills, family succession, intestacy issues, trusts, property trusts, life assurance trusts, care home fees. Website design by Oliver's Wills - we made it ourselves.